I had a blast with this mini and with all the new Necron stuff coming out I have to admit I am tempted to paint up a few more. Need to be strong though, way too much unfinished stuff as it is. 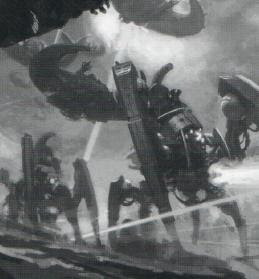 Though, reading through the new codex, the Necrons do look like an army that can both be extremely competitive but also very characterful. I'm nearly through the background, with rules coming into view tomorrow. So if anybody has any questions about the new book, don't hesitate to ask! One thing that really stands out to me is how this codex provides so much character for a previously rather faceless army and it does this, mostly at least, with interesting rules and background. Naturally GW is aiming to turn another, non-Imperium race into something that will be appeal to multiple types of gamers, but it is doing this very well. - The remaining named characters & whatever old mini GW would like to update. So, two release waves followed by another batch of extra minis (much like the Dark Eldar release) could see this entire army up-to-date with great looking models all round. Personally I'm just hoping GW will make the Triarch Stalker kit, what with me being a huge walker / dreadnought fan!